Imagine 14 street food traders. Crammed into one yard. Serving up everything from hot dogs to jerk chicken, from scallops to green tea choc ices, from buttermilk fried chicken to tofu and mushroom gyoza. Every Friday night? Does this sound like a foodie heaven? Well, yes. Yes, it does. When I arrived at Street Feast London at 8.30pm last Friday night, I felt pretty far removed from heaven. It was pouring with rain. The covered areas were so packed with people that rows of umbrellas were lining the fringes. Through the grim darkness and crowds, it was hard to make out what the traders were actually offering. Slowly but surely, we realised, with increasing horror, that many traders had sold out! Spit & Roast was packing up, people were walking away empty handed from Buen Provecho and the Ribman was nowhere to be seen! PANIC. I’d invited three sets of people who didn’t really know each other. They were all hungry, standing in the rain. Many of them required vegetarian options in the absence of halal meat. I felt severe guilt at leading everyone into what looked like would be a dismal and damp disappointment. My phone rang. More friends would be joining me soon. I’ll get you burgers, I told them, or you might not get anything at all. Eventually, I made it to the front of the queue and made my order to be told it would cost £45. I had £35 and I went off friend-hunting to scrounge a tenner. Then I did the maths and realised I’d been overcharged £13.10. Which he was highly embarrassed about. I was just relieved that I didn’t need to pay any more! 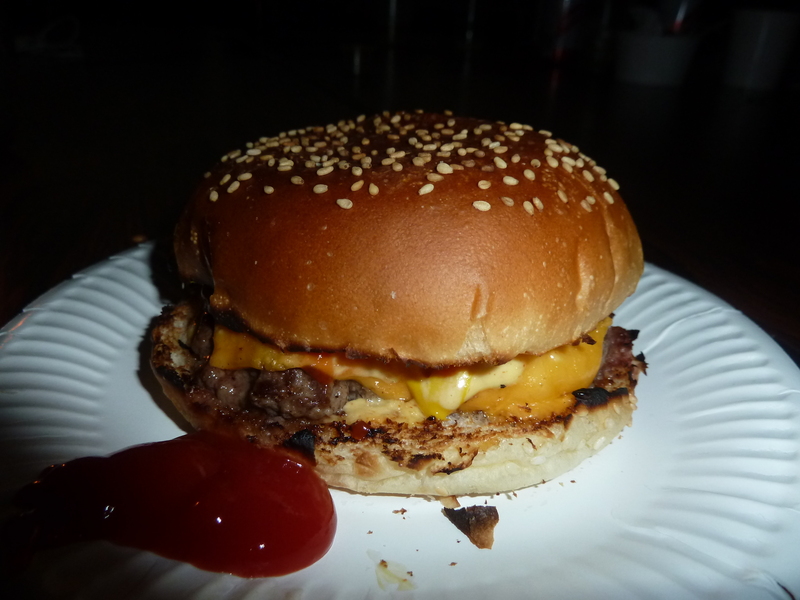 We were also very forgiving once we tucked into our Cheeseburgers (£5). 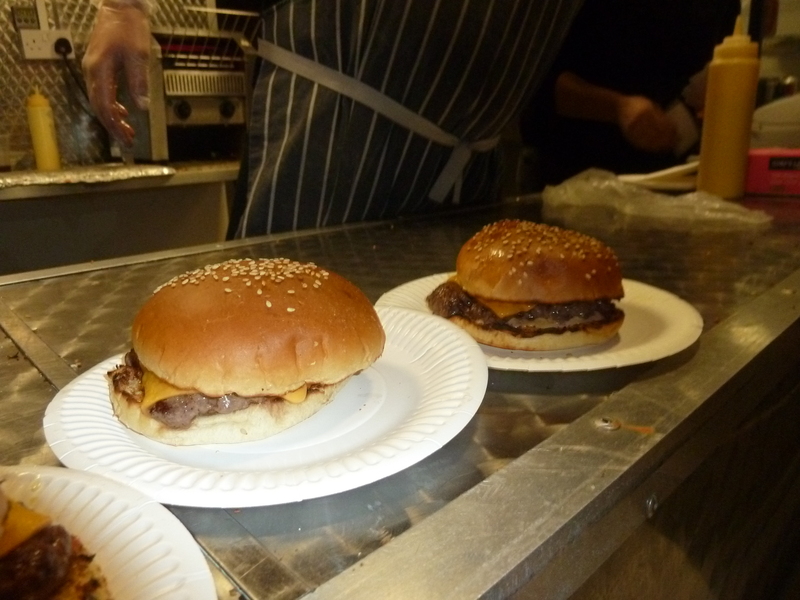 I had heard good things about Bleecker St Burger but I didn’t realise it’d be this good. The bun was light but held together well. 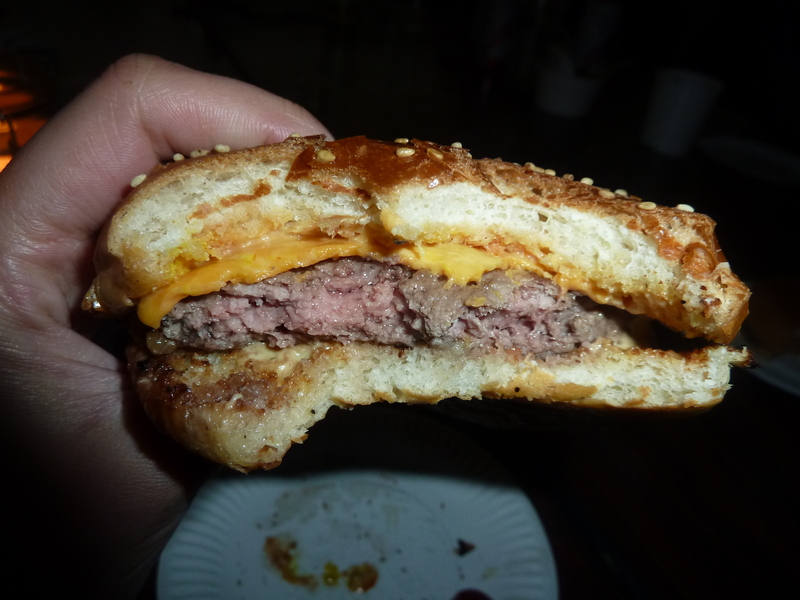 And the patty was one of the more succulent offerings I’ve tried. YUM. Forgiveness turned to all-out worship once we tried the sweet potato fries (£3). Oh my goodness. We turned to each other with a look of bliss on our faces. 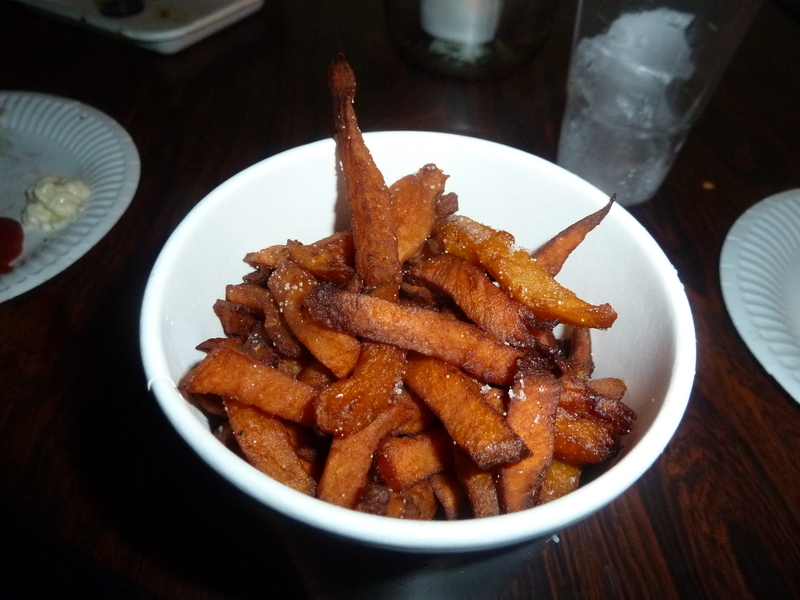 These might be the best sweet potato fries I’ve ever eaten. They looked a little soggy but were surprisingly firm. And they were simply exploding with sweet potato flavour. Sadly, our Beetroot and Goats Cheese Firebread with Watercress and Pea Shoots (£5.50) from Well Kneaded was no good, because they’d run out of goats cheese and had used ordinary cheese instead. Which turned into a minor flavour car crash – edible but not particularly pleasant. With goats cheese, however, I imagine it’d be fantastic. 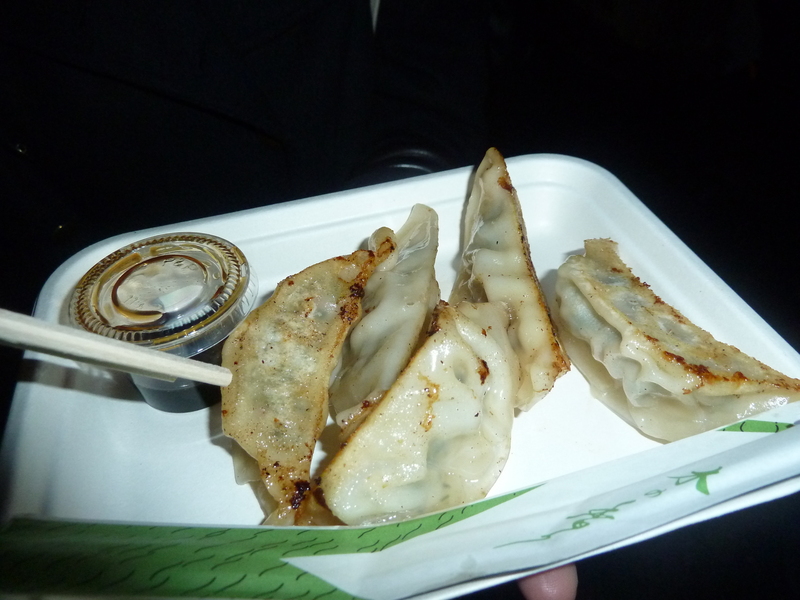 My friends also tucked into some gyoza from Rainbo (8 = £6). Their Chicken and Coriander is really unusual, and they do a surprisingly meaty Tofu and Shiitake Mushroom version for veggies. 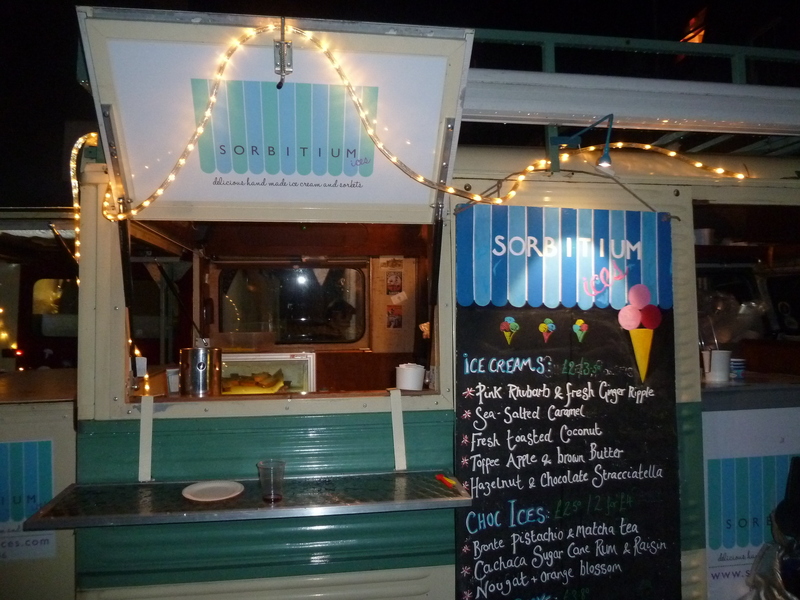 To finish up, we ambushed Sorbitum and sampled an array of dazzling flavours (2 scoops = £3.50). 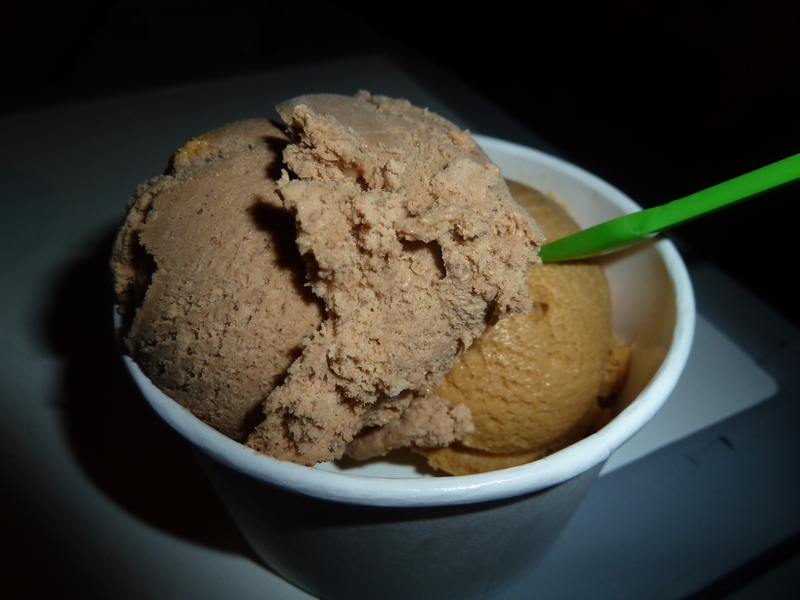 I was fond of the Chocolate and Hazelnut flavour – it was like praline in ice-cream form – and I also enjoyed some salted caramel. Really intriguing however was the Toffee Apple and Brown Butter and ginger fanatics should not miss the Fresh Ginger and Pink Rhubarb Ripple. So our mood was drastically improved by full stomachs. And the rain having the decency to pause whilst we were eating. Street Feast has promised on Twitter that traders will bring twice the amount of food next Friday. Phew! Cos I’ve got a lot of eating to do. And if you like food, I advise you make plans to head there too.